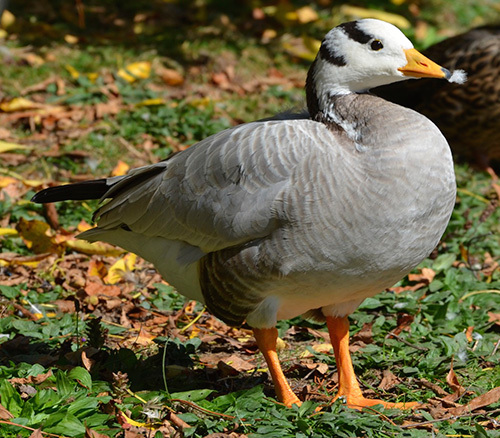 Description: A small grey goose with a distinctive white head featuring two black cranial stripes, the bar-headed goose weighs 1.5–3 kg (4-7 lbs) and has a wingspan of 1-1.5 m (55-62 inches). 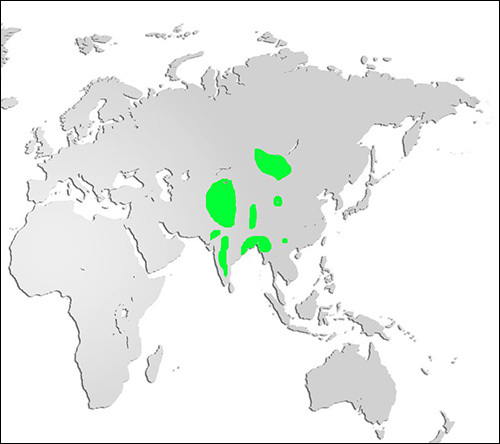 Distribution and Habitat: Native to Asia, the bar-headed goose migrates over the Himalayas, making it the world’s highest altitude migrant. From winter feeding grounds around the lakes in lowland India and northern Burma (Myanmar), bar-headed geese catch high altitude tailwinds that help propel them over the Himalayan Range to and from their summer nesting areas on the Tibetan Plateau, southeast Russia, northern India and western China. Diet: Mostly herbivorous, eating mainly grasses, some aquatic plants and rice. Life Cycle: The female goose incubates a clutch of 3-7 eggs for 28 days in a ground nest found in short grass, typically near a lake. Fledglings reach maturity after 50 days and achieve sexual maturity at 3 years. Did you know? Bar-headed geese can cause significant damage and plant loss to rice paddies found in their winter feeding areas.